Built in 1857, Mechanics Hall has been judged by architectural historians as the nation's finest pre-Civil War concert hall. For nearly 150 years, the Hall has been the cultural cornerstone of Central Massachusetts and is ideally located in downtown Worcester. It is listed in the National Register of Historic Places. 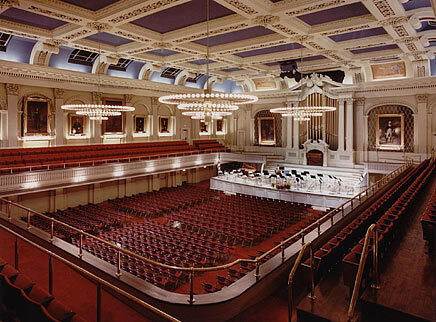 Mechanics Hall is heralded as one of the four finest concert halls in North America and among the top 12 among European and American halls. Internationally regarded by performance artists for its superb acoustics, the Hall also houses a complete recording studio. Like all other top concert halls Mechanics Hall is shoebox shaped, and is not compromised by the currently common desire for flowing curves and more, ever more seats. For the sampling of mechanics hall, all the seats were removed.